This was such a great read. The kind of end of book can’t put it down feeling from the beginning! 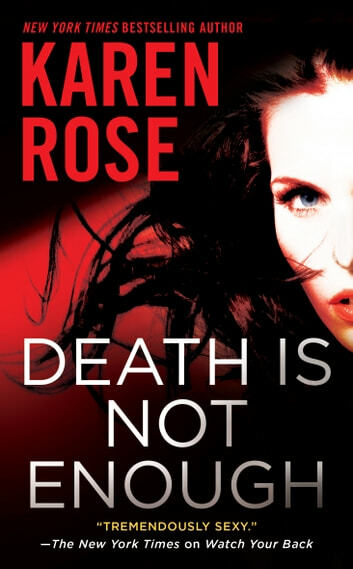 DEATH IS NOT ENOUGH is a dark suspense with intricate plot lines and layers upon layers of intrigue, lies, and explosive secrets. Just when you think you’ve figured out what’s going on, a new dynamic is discovered that turns the storyline upside down! Ms. Rose never disappoints with her compelling stories and character development. Her ability to create complex villains is quite deliberate and totally scary! The only issue I had with the book is that I didn’t feel any chemistry between Thorne and Gwyn. He came off as a jerk to me. Instead of telling Gwyn how he feels, he does some juvenile things that essentially ends up hurting Gwyn. Wasn’t a fan of the pairing. I felt they were better off as friends and business partners. I also had some trouble following the dialog when there were several characters in a scene. But that’s par for the course when there are a lot of characters in a book. Trigger warning: This book contains some scenes that may cause readers discomfort. If you have triggers from violent subject matter, this may not be the book for you. This is a chilling read that will capture your attention and hold it to the end. I voluntarily read a copy of the book generously provided by the publisher in exchange for an honest review. All thoughts and feelings expressed are my own. An excellent book with familiar characters. Suspenseful but with enough mystery to keep reading. We know who the villain is but do not understand the motivation for his rage nor do we know how current events connect to those nineteen years previously. The mystery unravels but not until near the end does it come together.